Jaime Pereira and David Fink, from Ecosystem Energy. 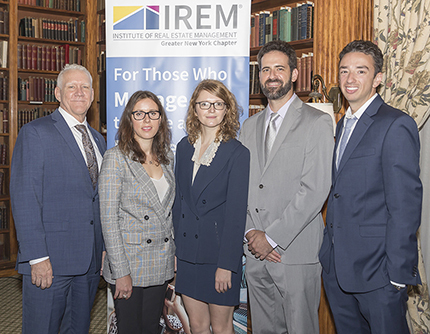 New York, NY Elena Ashkinazy, sustainability director at Time Equities Inc. was the keynote speaker at IREM Great New York chapter’s September luncheon. Her discussion on “Smart Technologies in Residential and Commercial Real Estate” certainly held their member’s and guest’s attention! The chapter is grateful to Ecosystems Energy, their Industry Partner event sponsor. At the luncheon, six new IREM members were sworn in by our chapter president Stephen Masom, CPM, at our September 12th luncheon meeting. 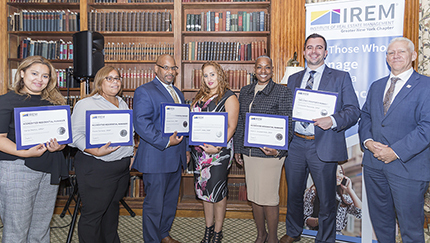 Receiving the Accredited Residential Manager (ARM) designation are: Vania Merino, Fifth Avenue Committee; Elaine Santana, Parkchester South Condominium; Orlando Osorio, Esplanade Gardens; Laurette Valdez, Parkchester North Condominium and Faith Campbell Wolfe, Parkchester South Condominium. Christopher Perkowski, Enterprise Community Asset Management, received his Certified Property Manager designation. Laurette Valdez, Faith Campbell Wolfe, Christopher Perkowski, and Steven Masom. On October 22-24 & 29-31 an Accredited Residential Manager course will be held from 8 a.m. to 4 p.m. at Knickerbocker Plaza, 1751 Second Ave. Successfully complete the class and exam and you will be an ARM! A standard calculator is required. IREM member price is $960 and non-member is $1,175. On Wednesday, November 14th, from 8 to 10 a.m., IREM will hold a breakfast meeting at the Union League Club, 38 East 37th St. The meeting will feature “Affordable Housing Panel: Yes, your business can afford to be in affordable housing!” Panelists include Robert Corso, CEO, C+C Apartment Management; Derrick Lovett, president, MBD Community Housing Corp., and representatives from NYCHDC & ANHD. The panel will be moderated by Randall Powell, CPM. The price is $60 for members and $75 for non-members. Networking coffee “hour” sponsored by Guardian Service Industries. IREM will also hold their Annual Dinner & Awards on Thursday, February 7th, 2019 at 230 FIFTH. Mark it on your calendar now. Details to follow! To register for any of IREM’s courses or events, or for more information, call 212.944.9445 or visit www.iremnyc.org.